On nearly any other mountain in the Northeast, the Helon Taylor trail would be a destination hike unto itself. 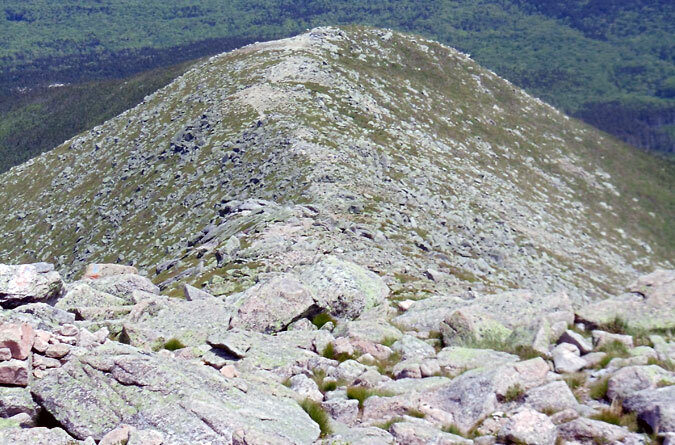 On Katahdin, however, it’s often relegated in discussion to “the most direct route to the Knife Edge,” but this is no ho-hum hike. The mostly exposed ascent of Pamola’s rocky spine with views for miles is truly remarkable—not to mention exhausting. Here’s to enjoying the commute! The hike begins at Roaring Brook Campground with a quick 0.1 mile jaunt up the easy going Chimney Pond Trail. 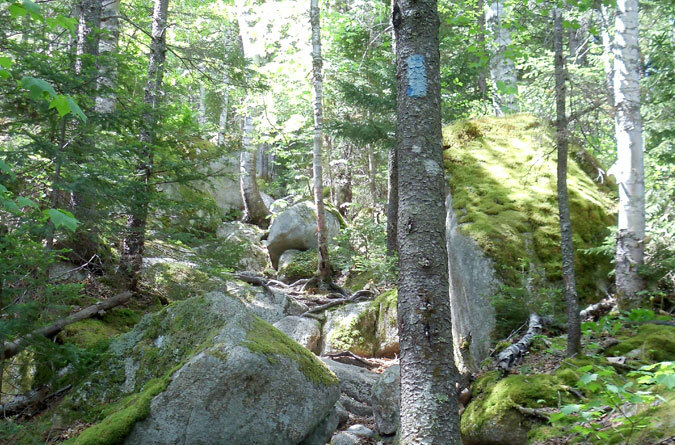 The Helon Taylor Trail, named after a celebrated former Baxter State Park supervisor, begins it’s 3.1 mile trek on the left with a moderate climb up a path entwined with rocks and roots. The beginning of the Helon Taylor Trail at the junction with the Chimney Pond Trail. The rocks get bigger as the trail approaches treeline, a few of which require scrambling and possibly hopping. 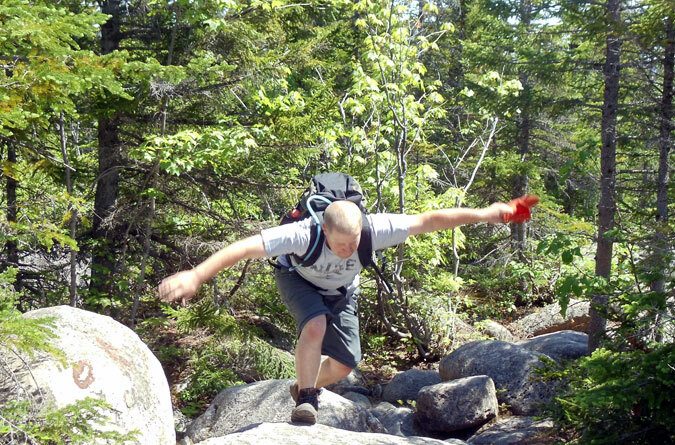 My brother Mike jumping from one boulder to the next on the Helon Taylor Trail. Exiting the trees begins the ascent up Keep Ridge, where most of the Helon Taylor Trail’s 3,413 feet of elevation gain is earned. Looking up, Keep Ridge appears as one long, steep staircase into the clouds that makes the gym’s stairmaster seem like a tricycle with training wheels. Once onto the ridge there’s no cover, nor any place to seek shelter, so make sure you’re prepared with plenty of water, all weather gear, and sun protection. Steer clear of this hike during inclement weather. The view of Hamlin Ridge from the Helon Taylor Trail. Switchbacks? Ha, the Keep Ridge laughs in the face of switchbacks. 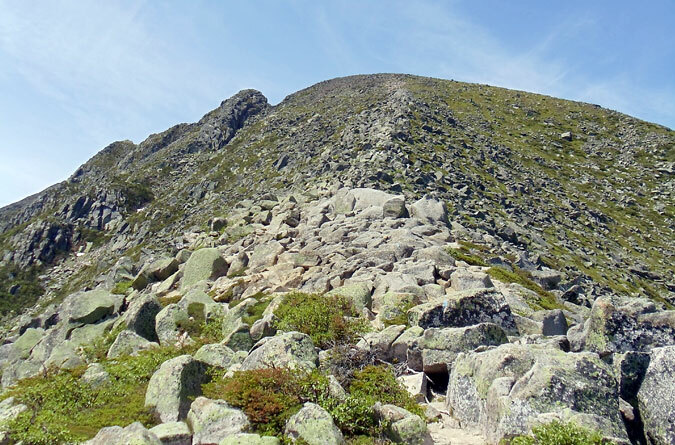 In fair weather the Helon Taylor Trail delivers an extended look at the south side of Katahdin’s Chimney Peak and Knife Edge, giving plenty of time for that nervous pit in your stomach to grow. 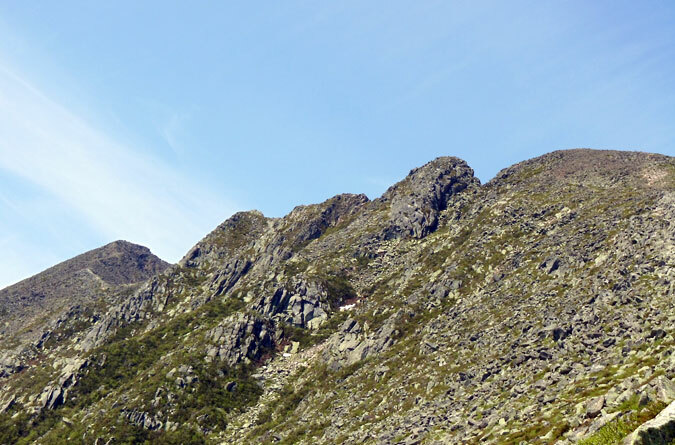 Pack plenty of water, it takes a lot of sweat to look down Keep Ridge. 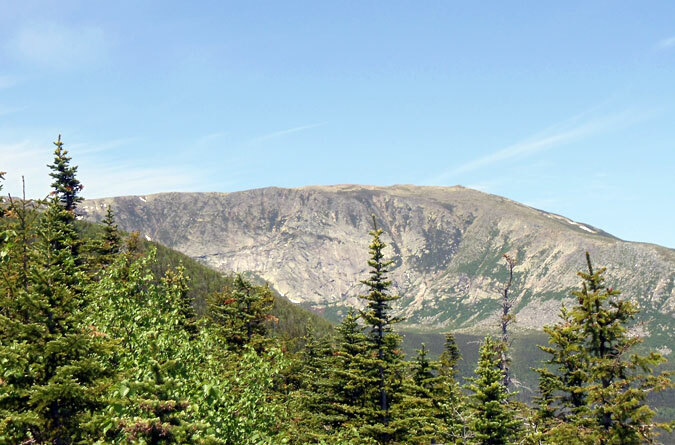 The Helon Taylor Trail tops-out at Pamola Peak (elevation 4,902 feet) at the junction with the Dudley and Knife Edge trails, the latter of which gets our vote for the most spectacular trail in the Northeast. 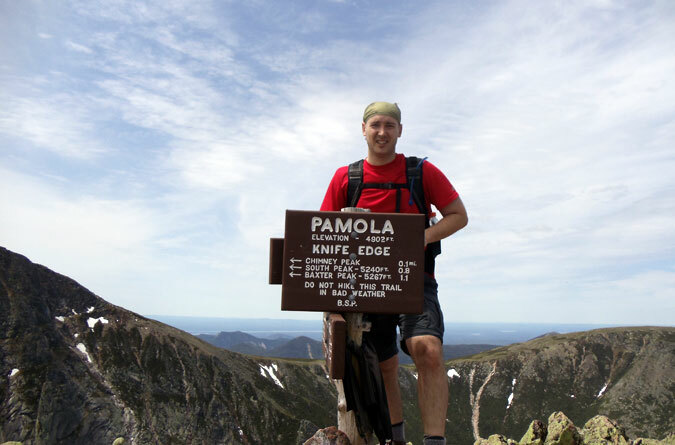 If you’ve got your brave hiking boots on, and Pamola, Katahdin’s deity feared for her fickle territorialism, is playing nice with the weather, continue across the Knife Edge to reach Baxter Peak, Maine’s highest point (elevation 5,267 feet). Atop Pamola Peak before taking on the Knife Edge. 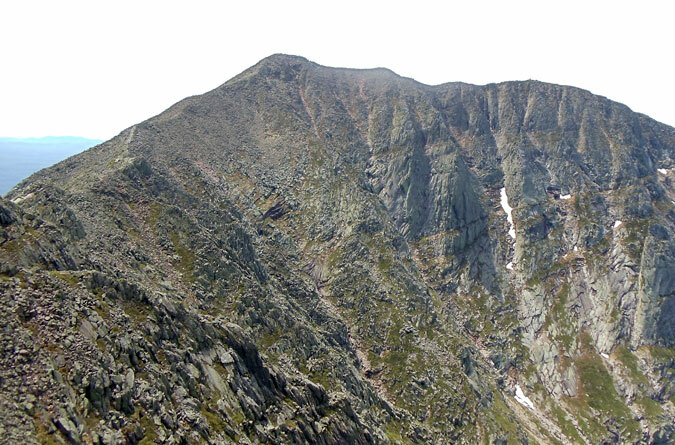 Looking across the Knife Edge at Katahdin’s South Peak, elevation 5,240 feet.